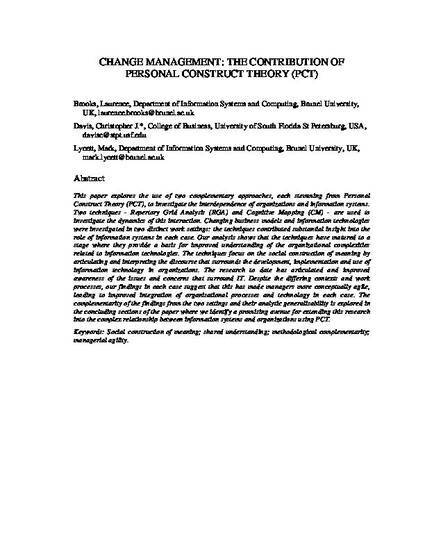 This paper explores the use of two complementary approaches, each stemming from Personal Construct Theory (PCT), to investigate the interdependence of organizations and information systems. Two techniques - Repertory Grid Analysis (RGA) and Cognitive Mapping (CM) - are used to investigate the dynamics of this interaction. Changing business models and information technologies were investigated in two distinct work settings: the techniques contributed substantial insight into the role of information systems in each case. Our analysis shows that the techniques have matured to a stage where they provide a basis for improved understanding of the organizational complexities related to information technologies. The techniques focus on the social construction of meaning by articulating and interpreting the discourse that surrounds the development, implementation and use of information technology in organizations. The research to date has articulated and improved awareness of the issues and concerns that surround IT. Despite the differing contexts and work processes, our findings in each case suggest that this has made managers more conceptually agile, leading to improved integration of organisational processes and technology in each case. The complementarity of the findings from the two settings and their analytic generalisability is explored in the concluding sections of the paper where we identify a promising avenue for extending this research into the complex relationship between information systems and organizations using PCT.